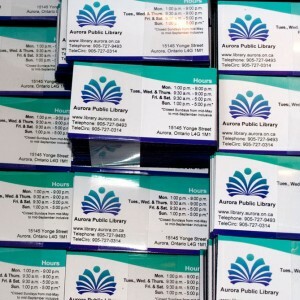 Turnaround time for most business cards is 2-3 days. Please add a day for rounded corners and special finishing. Shipping time depends on your location, most parcels arrive with 3 days. We can update to express shipping, additional charges may apply depending on your location. Brand new for 2017. The name Granite says it all. These cards really have the WOW factor. They present a strong and powerful message that you are at the top of your game. They also lend themselves to take a black and white photo, a very contemporary look, and are guaranteed to get you noticed and remembered. You can easily mix and match the business card backs for a unique look. Business cards are used more than any other single marketing item so make sure yours will be personalized to your style. These looks will work well with banners and other signage to keep your branding consistent. We recommend the matte or gloss finish for the Granite series, they both look great. 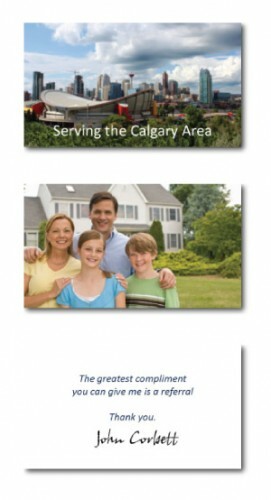 For maximum effect, we recommend that your photo has a white background. Also take a look at our new Velvet laminate, with the Granite series they are truly awesome. Ask us about all the other available finishing options. 16pt heavy weight pure white card stock with a high gloss UV coating for brilliant durable business cards. 16pt heavy weight pure white card stock with a high gloss UV coating on the front and an uncoated back for notes. Uncoated cards are great for appointments and giving information to potential clients. Beautiful premium smooth matte finish that is easy to write on. Handy for confirming an appointment or giving a phone number not on your cards. These uncoated cards have the look and feel of fine linen, will definitely get you noticed. Class up your act with Silk Cards! Silky smooth to the touch with a matte appearance, Silk Cards are laminated on both sides giving these cards an attractive look and feel, while further making them water and tear resistant. 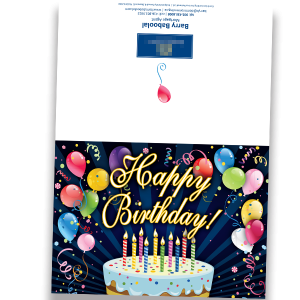 These long-lasting 16PT cards are a surefire way for you to bring sophistication to your image and to stand out from the crowd. Silk Cards are printed in full color and come with options for foil. Feel the difference with Velvet Cards -- soft to the touch, they bestow a hint of luxury to brands and create business cards that stand out from the competition. 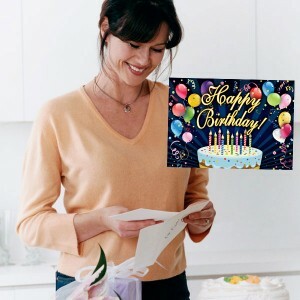 Velvet Cards are printed with high quality equipment on 16pt card stock, then they are laminated on both sides with 1.5mil scuff resistant, soft velvet laminate, which give them a substantial thickness of 19pt. Our 14pt Metallic Pearl paper is a unique stock that shimmers in light when viewed from different angles. The stock itself is embedded with Pearl fibers that give the paper an overall smooth, metallic look. Printing on this stock will give your colours a subtle shimmer. 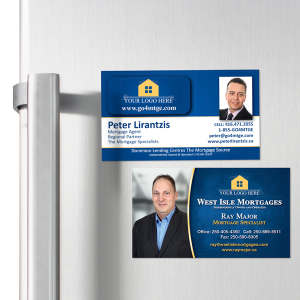 These cards are a great way to put your business in the lead! They offer thousands of practical and promotional applications. 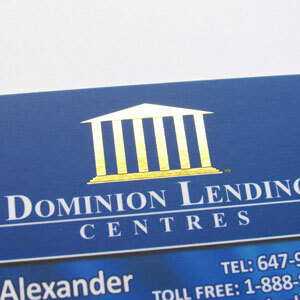 Plastic Cards are durable and printed on 20PT Plastic Opaque White stock with rounded corners. Quantities of 2500 and above, please contact us for pricing on options. Highlight your logo, photo or anything with spot gloss. 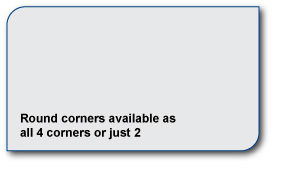 Available on most card stock finishes. Bring extra flair and shine to your business! 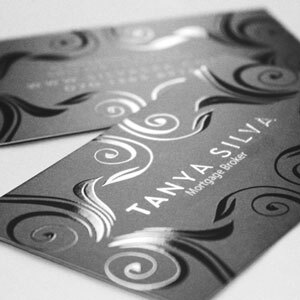 Choose from either gold, silver or copper foil accents for your business cards on 16pt silk laminated cards. The combination of foil with this finish is a surefire way to make a statement. Please note that the same color foil must be used for the front and back of your cards. 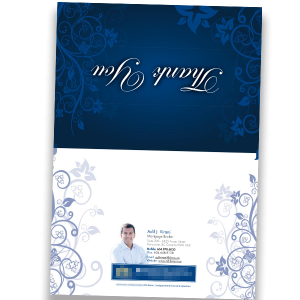 Make your cards stand out with rounded corner option. 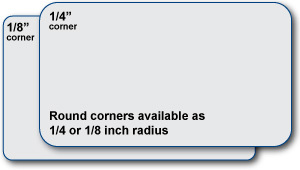 No Round CornersRound Corners all 4 - 1/4" +$25Round Corners all 4 - 1/8" +$25"Round Corners just 2 - 1/4" +$25"Round Corners just 2 - 1/8" +$25"
All business cards can be edited to have a custom back.